Alright my fashionable friends, you asked for it! You asked me to talk swimsuits, so may I present to you Part 1, Cover Ups. 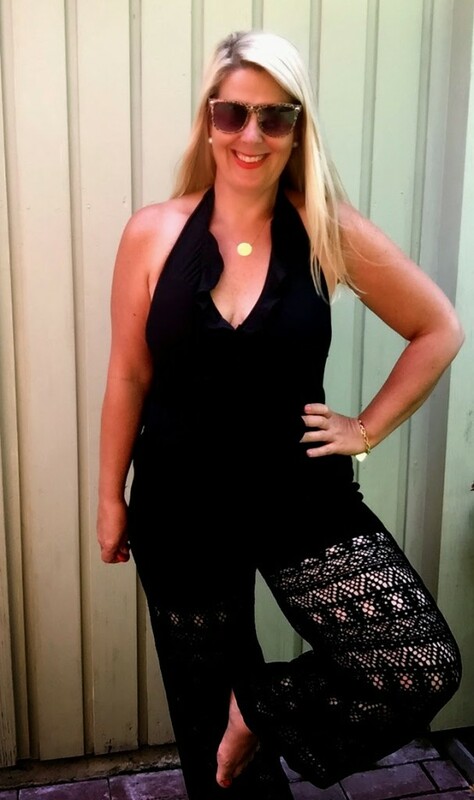 Be sure to read next week when I show you some of my favorite swimsuit picks for this season as well as what to wear for your body type. As my readers know, I’ll be heading to Hawaii this summer to celebrate my lovely husbands big 4-0! 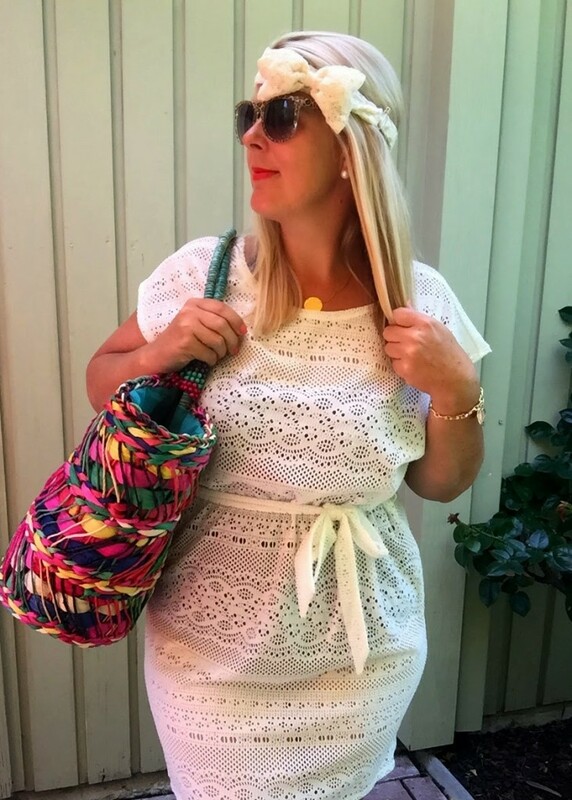 So perfect time to put on my swimmers and show you a little YummoMummo styling. 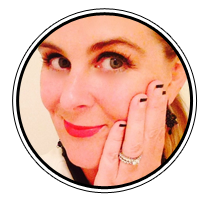 I am showing you four VERY different looks so there should be something for every taste. All cover ups are from Target, so a very affordable fashion item. 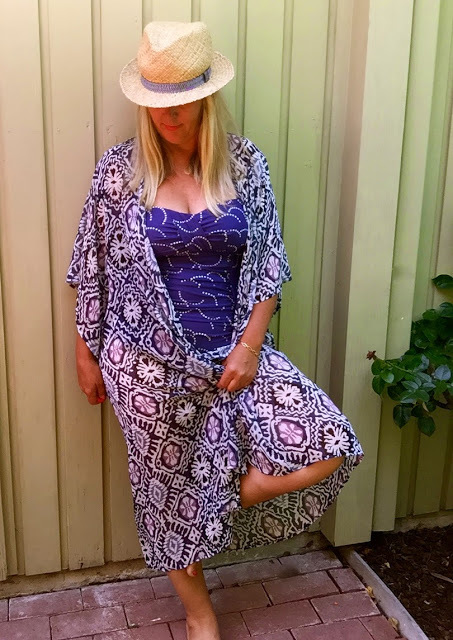 I love the length of this swimmer kimono in purples, blues and blacks. It is like wearing a super flowy bathrobe. This cover up could also double up as a long kimono over a black sundress – two outfits in one. Love versatility in a piece! The ruching in the front is perfect for taming the tummy and mid-section. 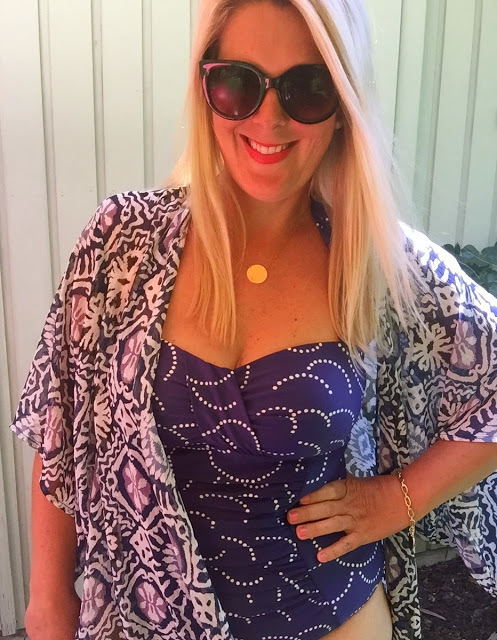 This swimsuit was gifted and is originally from Boden USA. The color is a deep purple, so fun to play with a color. A black suit is such a great staple and I love how the details of the scalloped criss-cross across the bust gives it that little bit more something. This was gifted and is Anthropologie. The skirt is actually a sarong wrap that has been made into a skirt so the tying is already done for you, just pull it on! The tribal design will bring you right into SS15 and you can never go wrong with a monochromatic look! So classic. I had a lot of fun styling this outfit, as you can see. The cover up is perfect for putting over a wet swimsuit as the eyelets let in a lot of breeze. The tie waist brings it in for a more flattering look. I paired it with my daughters headband from Claire’s to add a fun pop and tie the outfit together. And what a cute beach bag! Love the colors against the neutral base. These pants scream FUN! Paired with a black swimsuit, pop them on and head on over to the poolside restaurant for lunch! So these are my two swimsuits I will be wearing this summer. 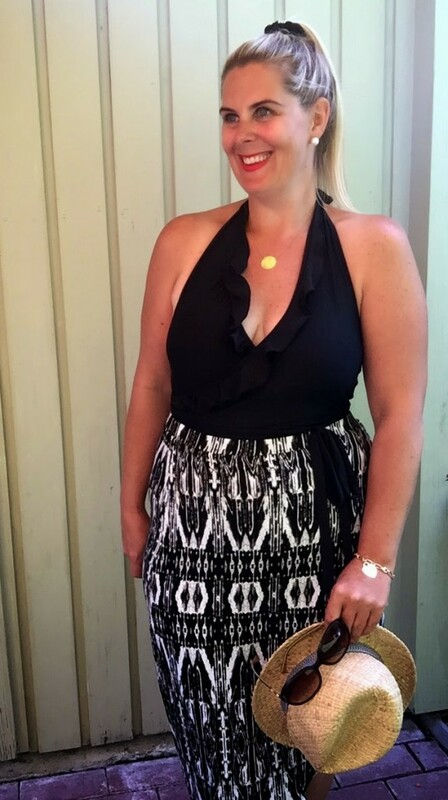 The left is fun, colorful, patterned, ruched, and can convert for strapless wear. The right is completely different in an always flattering black, has a tie waist, and scalloped V. Two very different pieces. 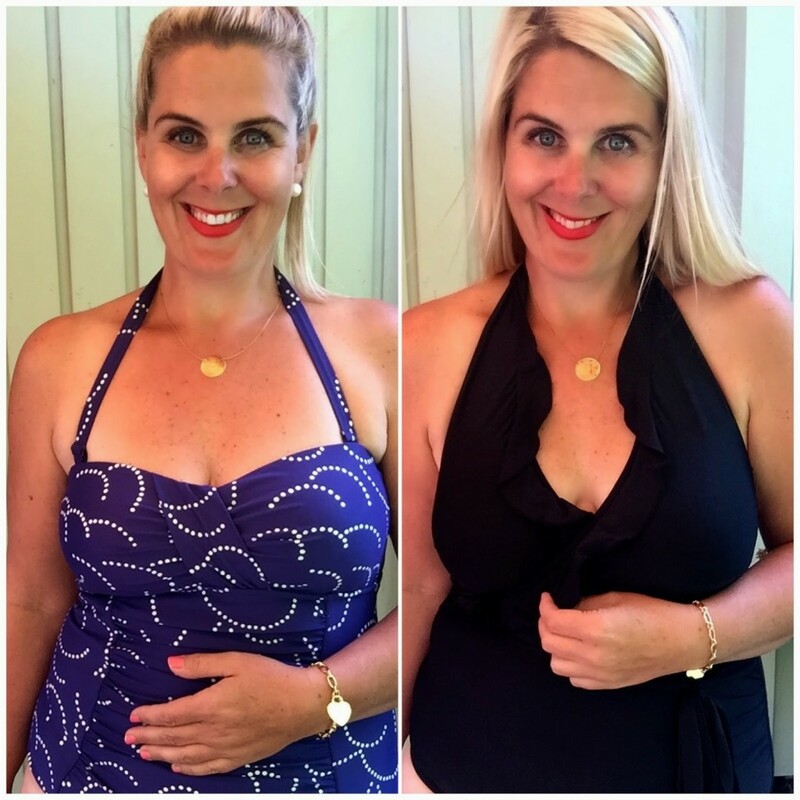 Stay tuned for my post next week on everything this season’s swimsuits and what to wear for your body type! Have you found your summer swimwear? You look fantastic in those suits!!!! Such a beauty!! Swimsuits are always so hard to find, but those are both fantastic! I especially love the blue/purple suit and the kimono wrap. What a fun swimsuit look!